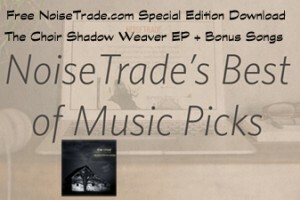 NoiseTrade.com offered kind words and encouragement on our new album, Shadow Weaver. One of the editors selected it for their Best Of 2014 (so far). This EP is a gateway drug to Shadow Weaver, the latest album by one of my all-time favorite bands and also brief retrospective of their storied career. Their music is a study in apparent contrasts: ethereal / gritty, whimsical / earnest, joy / sorrow , poetic / plainspoken, spiritual / human. If you don’t yet know The Choir and like rarefied alt pop, take this EP for a spin! I’ve been a fan for years and this release solidifies my fan status for years to come.